The older I get, the more I become aware of my own mortality. A rather sad opener, right? It is, and it isn’t. When I was kid, I had no concept of death and what that meant. I wasn’t thinking about whether I’d make it to tomorrow but instead about how many hours of video games I’d be able to squeeze in-between homework and dinner. However, with age comes maturity – and the realization that I will not be around here forever. That thought scares me; I want to see everything that life has to offer. But I won’t. I know that, and that’s the sad part. Yet, in a paradoxical manner, that’s also the uplifting part. My time is short, so I know that I must do what I can now to make the most of it. From enjoying the moments with my loving family to fighting hard at making writing a potential career, I believe I’m doing just that. There’s still a lot left to get to, but that thought simply makes me more motivated than ever before. Shuumatsu Nani Shitemasu ka? Isogashii desu ka? Sukutte Moratte Ii desu ka? (which will hence be SukaSuka from here on out because jeez laweez) thinks about these same thoughts, too. And while this entire project may not reach the pinnacle of storytelling, what it has to say is still worth hearing out. On a day like any other, a blue-haired girl named Chtholly crosses paths with a man named Willem in the streets of a city that rests atop a floating chunk of land. 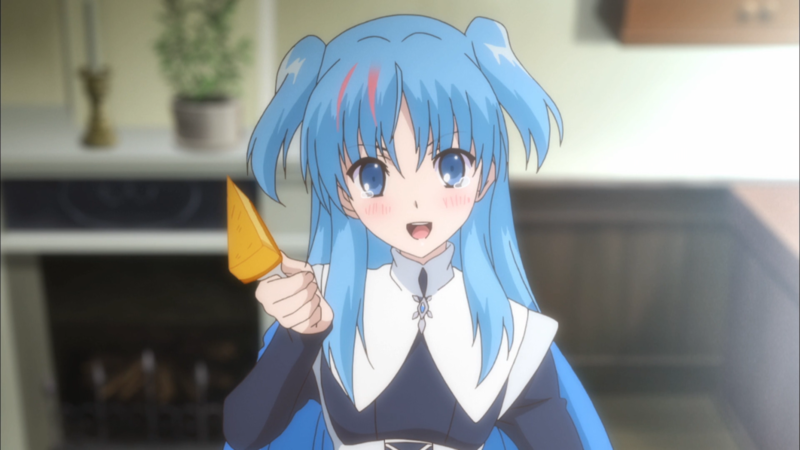 They spend the day together as newfound acquaintances but must eventually part ways – only for him to coincidentally become the caretaker of a warehouse that houses her, other girls of a similar or younger age, and a bunch of top-secret “weapons.” When Willem learns that those weapons are the very same girls he now looks after, SukaSuka finally gets its core underway. At its core, the anime explores two major themes: the inevitability of death and the pursuit of happiness. Rather profound ideas to say the least. But that’s SukaSuka. Wrapped up in this science-fiction-fantasy landscape, a microcosm forms around Chtholly, Willem, and the lives they experience, presenting to the audience a world both simultaneously too large to comprehend and too small to ignore. For most people, death isn’t always on the mind. They think of it is as something far and away from the daily troubles of jobs, relationships, and hobbies. But it’s there. It’s inevitable. Death comes for everyone whether wanted or not. Interestingly, with SukaSuka, it not only devalues the lives of the fairies therein but also reduces the lifespans they carry. So, death isn’t just inevitable – it’s right around the corner. And Willem’s petrification does not last forever; death will find him in the end too. For most people, happiness is on the mind. In an indirect sense at least, for people always want happy emotions to replace the negative ones acquired from all over. They fail at those jobs. They break apart those relationships. They reach a roadblock in those hobbies. Once again, SukaSuka shows the same but to a greater degree. Chtholly’s mental disintegration and Willem’s unfair fate bully them throughout the entire season, making it really hard for them to defend themselves against the onslaught of negativity. These two themes represent a duality within SukaSuka. Indeed, death and happiness interlink their existence within the show. After all, how can one be happy when death creeps ever closer? To the anime, it argues that one’s personal end cannot earn control. Otherwise, there would be no point to doing anything. Chtholly understands this sentiment, saying as much during her musings while she takes down laundry or cooks that next meal for the night. To put it differently, escaping death is a fool’s errand for Chtholly, Willem, or even the audience watching this tale play out. Yet happiness is still something sought after and fought for. If the inevitability of death is a truth, then so is the fact that happiness comes in all shapes and sizes. As Rhantolk tells Chtholly, happiness is a feeling that cannot so easily be defined because it means something different to everyone. Such happiness does not have to be an intimate, romantic relationship as seen here between Chtholly and Willem. It can be enjoying a winter festival with friends and loved ones. It can be marveling at the sights of a town featured in the many lizard-centric films available. It can even be a simple butter cake whose delectable fluffiness counts as a promise upheld. All that matters is finding and cherishing whatever that happiness may be. Because, yes, death is inevitable – but happiness makes that truth not worth worrying about in the slightest. To reiterate, SukaSuka’s themes here are pretty good. The trouble, however, comes from the rest of this story. For starters, the show has a strange pacing problem. It often sticks itself in this weird state of not that fast but not that moderate, showing a little bit more than just enough to make the scenes relevant but not enough to give them the impact they require to bolster the plot. For instance, Chtholly sometimes mentions how its thanks to Willem’s training that she survived her battle in which she was destined to die. But that “training” consisted of only a small minute-or-so scene that the anime never elaborated on or showcased beyond a few pieces of dialogue and a couple of swings of their swords. Many of the events are also quite anticlimactic. Simply put, a handful of SukaSuka’s story beats do not punch hard enough when the plot divulges its content for one reason or another. For example, in episode ten, Willem comes to the “stunning” realization that the beasts are actually genetically deformed humans. Quotes used because the reveal is dampened by the lame nature of the connecting dots at hand and the mishandled delivery in shoving into the audience’s faces a series of unnecessary mini-flashbacks to conversations heard literally minutes prior. Weird tonal issues exist, too. Sometimes as far into the season as episode ten. Therein, Chtholly’s comedic bits and the crew’s teasing of Willem don’t have much of a place in the narrative. Not only because of the danger and the troubles they are experiencing but also because the audience knows the impending dramatic climax depicted in the very first episode at the very start of the season will arrive at any second. And weak writing in general hurts SukaSuka. Suwong and Eboncandle show up in episode six as big parts of Willem’s past life, but they almost never reappear for the rest of the show’s run afterwards. In episode eight, Chtholly’s dramatic saving and Willem’s subsequent crying fall flat since the little girl who falls off the tall post isn’t one of the few girls that the anime took the time to highlight but rather some no-name kid. And it’s super convenient that the ruins they investigate in the last section of the anime just-so-happen to be where Willem grew up. Arguably, even the ending has problems to point out, for it’s a bit too up-in-the-air. It isn’t so much bittersweet as much as it seems just straight bitter since it seems like everyone “lost” in the end regardless of their actions. At the minimum, the anime either drops plot points or doesn’t clear up enough to make it a satisfactory conclusion. What happened to the sword that put them on their last lost cause to begin with? What about Grick? Willem? What does the rippling GPS water mean? And presuming that the absolute final scene is of Chtholly’s reincarnation, how necessary of detail is it after everything that has happened? Taking all of these elements into consideration, SukaSuka clearly makes it awfully hard to say the writing around its important ideas does enough to support them. Even so, some items can be excused. The Seventeen Beasts threaten the world, and they continue to do so when the anime concludes, but they were merely a backdrop to this tale. While the whole gods-descended-to-kill-humans-to-stop-them-from-killing-their-world-and-thus-themselves angle is a bit absurd as an explanation on the show’s part, it was never its intention to solve this thread outright. Plus, credit where credit is due. 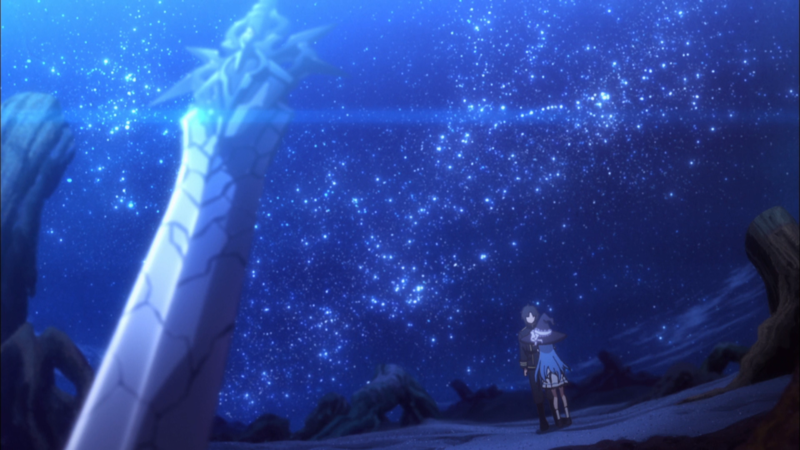 The anime does an okay job of creating a believable fantasy world. It visits different locations like the sky islands and the animal-people-filled cities. It uses terminology like “emnetwhits” (or “original humans”), “carillon” (or “talisman weapon”), and “venenum” (or “magic energy”). It explains some of its rules like the origins of the fairies themselves. This world-building comes mostly in the form of heavy exposition rather than weaving it seamlessly into the plot, but having it around for the setting is welcomed all the same. Altogether, the anime does hamper the efficacy of its thematic exploration with a wide array of questionable choices. But those themes on inevitability and happiness are inherently strong. And, to be fair, the show then includes the occasional buffer to balance out some of those grievances anyway. So, all told, the story is left in a fine state that perhaps could have been better but could also have been way worse. When it comes to the art that SukaSuka boasts, it prides itself most on the designs of its characters, for they reach across a spectrum of details. Like Grick the goblin or Limeskin the lizard man, these designs can sometimes be fantastical in nature. Like the kids of the warehouse, they can sometimes be very colorful. Like Willem and Chtholly, they can be proper or cute (respectively) in their getups. More characters and thus more designs of course exist, but, with just this handful of examples, the anime makes it easy to spot and to understand the variance and the detail for these designs. Variance also appears during other parts of the season. Namely, the show includes the occasional spectacle to add some intrigue to the show’s proceedings. At first thought ignored, the anime showcases Chtholly and the other girls’ fight with the demonic beast in episode five. Their final charge during the final episode against the regenerating beasts, especially Chtholly’s final stand. Willem’s neat carillon tuning exercise with the light bubbles and floating pieces. 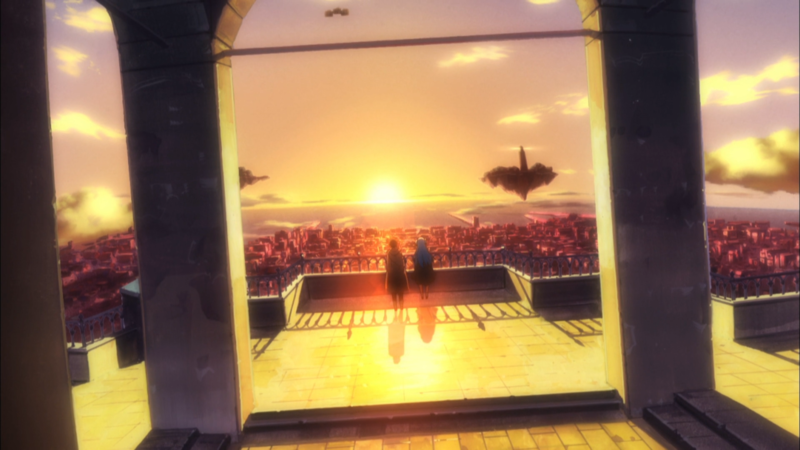 Their sunset view overlooking the city where they first met. These moments are few and far between, but they give the show something cool (albeit at times sad) to watch. A lot of the background art also has its place. The faraway shots of the different islands. The greenery and shrubbery of the locations. The quaint depictions of the towns and their busyness. The warehouse where Willem and the others stayed with its rooms and details and lighting. 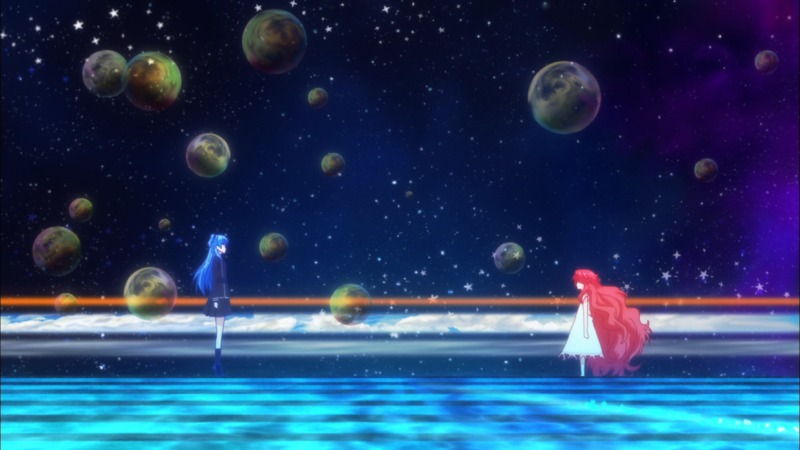 Nothing too extravagant on SukaSuka’s part, but this art can make the show pretty when it wants to. Otherwise, the anime doesn’t have a lot of impact on a visual front. Cinematography remains mostly an afterthought, even having a couple of strange cuts or framed shots littered throughout the season. And actual animation never really sticks out. Since the style involved does not aim for intrigue, it falls on this movement to engage the audience, but the constant slow panning, rather unmoving, and simply plain shots turn many of the normal conversations and moments held between the characters into dull events. With the art in general offsetting the boring cinematography and the lack of actual animation, the visuals come out fine for what they are and not much else. For SukaSuka, only two characters truly matter: Chtholly and Willem. These two “disfeatured” people meet by happenstance, spending the day together getting lost in town, listening to music, and enjoying one another’s company. At the end of the day, they must part, but not for long because Willem is assigned as caretaker to the very warehouse where Chtholly and many other girls (both big and small) reside. Now in the same relative space, they (alongside the audience) learn more about each other. Chtholly is just one of many fairies destined to open a Fairy Gate, defeating (part of) the enemy forces but costing her own life in the process. When not fighting on the front lines, she can be found looking after the other kids. In other words, she helps out as a mother of sorts around the warehouse as best she can. Her kindness and her acceptance continue to fit her in this role, too. Willem is somewhat similar. He is quiet and watchful, bonding with the older and younger girls alike through his different interests in cooking, reading, and learning. The first episode hints at the powers he himself keeps hidden, and, as events occur, his unique capabilities become more readily apparent even if they are not used all that often. The first three episodes setup Chtholly and Willem in this manner. On a more interesting note, however, they also form their arcs. In particular, they follow the same themes that the story does: the inevitability of death and the pursuit of happiness. For Chtholly, it’s the inevitability of death. She starts to experience nightmarish visions and paradoxical whispers in her head that slowly degrade her mind and her memories. Yet a lot of the talking points around this development do not hold fast. She often refuses to talk about it with anybody, lying and pretending to prolong the drama in SukaSuka rather than allowing it to play out naturally. The classic “It’s nothing…” response is particularly aggravating, especially when Willem would (presumably) do anything to help her feel better. But she still seeks out and holds relationships with other members of the cast to give her existence a purpose beyond death. She talks with Limeskin over some tea about “resolve and resignation.” Her jealousy towards Nygglatho over her forward behavior with Willem rises in her new emotions she has never felt before. And her aside with Ithea – despite the sudden, ill-timed, and not-very-meaningful backstory – draws parallels to a sense of self that everybody, including Chtholly, requires. For Willem, it’s the pursuit of happiness. 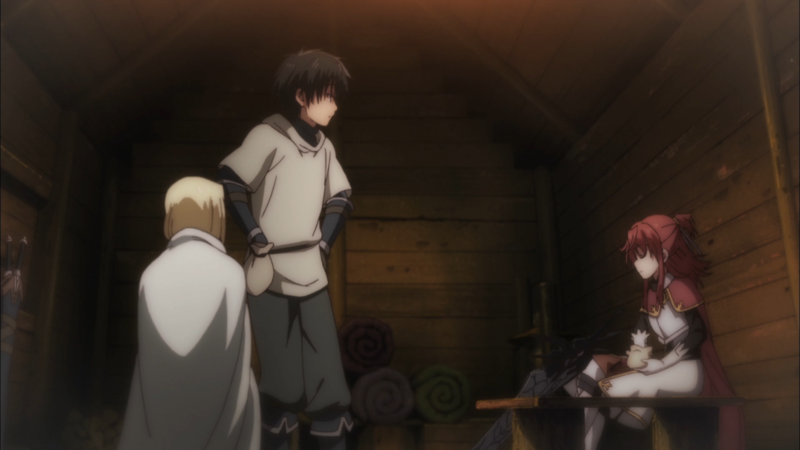 The anime tries to retroactively create his character through the use of several flashbacks. Unfortunately, these moments do not provide enough. He cares a lot about his previous life with his friends and family at the orphanage he used to stay at, but only one such miniscule scene is ever given. His time as a so-called “brave” is hardly ever shown except for right before his petrification, so the audience doesn’t actually see Willem in his prime. And just a tiny interaction with his former teammates that involves cookies comprises the majority of his regret. In short, Willem’s character simply lacks context to make his feelings and his actions worthwhile. Ironically, while Willem not having enough hurts his character, not doing enough helps instead. Near the end of the series, Willem remarks how he couldn’t do anything to save Chtholly. That his efforts were futile and (in an out-of-body experience of sorts) just a selfish way for him to make amends for his previous failures. Even if he “did nothing” the whole season, that’s part of the point. Just being there for Chtholly during her own time of need was, in fact, more than enough for her. Regardless of the mixed writing that forms the foundation of Chtholly’s and Willem’s respective characters, their bond finds strength. While Willem massaging Chtholly to rid her of venenum poisoning marks the most direct and physical interaction between the two, much of their relationship builds from smaller, grounded scenes that grow them closer together. 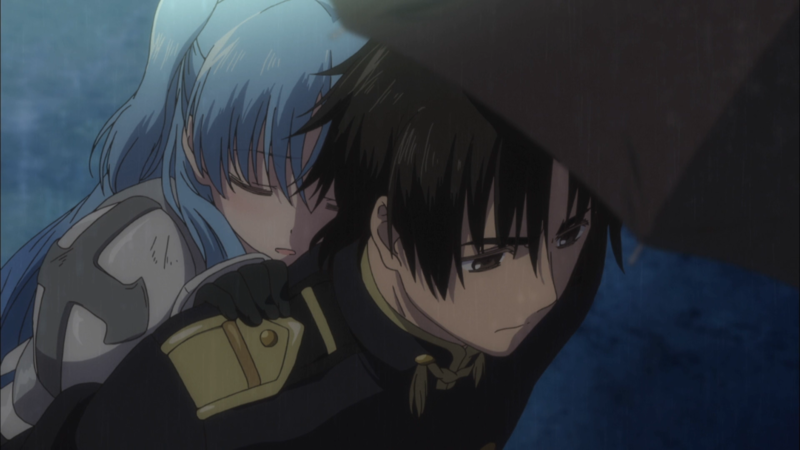 Him hugging her tightly after she returns from the battle in which she was meant to die. The butter cake scene. Him grabbing her hand while gazing at some shooting stars. Their shopping sequence as a “couple.” Showing off her dress at the night of the festival. His proposal. Their kiss and final, minimal exchange. They do not technically have any standout scenes, but their relationship grows into something not just symbiotic or romantic but also interlinked. Exactly like those two constant themes. Interestingly, as the series nears the finale, those respective themes on inevitability and happiness flip between the two. Willem basically loses the home he had grown to love, forcing his inevitable fate back into that of fighting because (as he would perhaps put it) that’s all he has. Chtholly, having now embraced death, declares herself as the happiest person anybody could ever possibly be regardless of what may happen now or in the future. Given the ending and its ambiguity, it’s tough to say whether Chtholly and Willem became better characters as a result of what they shared and what they experienced. 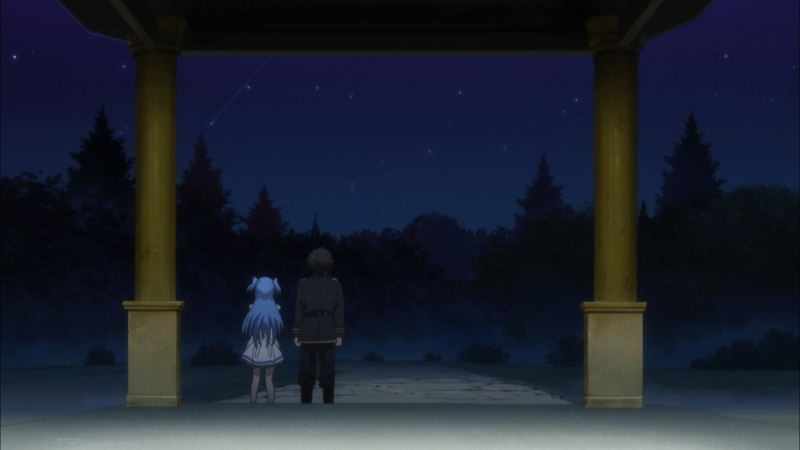 But, after listening to their final joint narration, SukaSuka makes it clear that their relationship at the very least brought out the best in them and their lives. Sadly, not everyone gets to experience something so magical. Yet they did. So, even if the outcome of this story is not the most ideal for the two, the audience can walk away from the show with a smile. Knowing that, like Chtholly and Willem, one should worry not about the inevitability of death and instead care about finding happiness in whatever shape that takes. SukaSuka’s musical offerings stand above a lot of the anime’s other traits. Mainly speaking, its original soundtrack has many a poignant piece that supports the steady stream of drama encountered throughout this story. 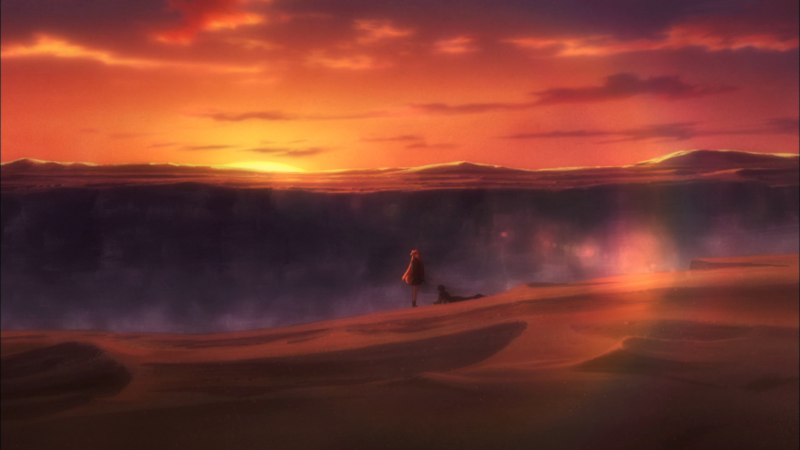 The tracks themselves incorporate a lot of orchestral segments that align with the grand yet localized nature of the anime. Female vocalizing provides backup to a slow, light piano ensemble. The sound of a recorder gives way to somber strings that create a fantastical longing in the listener. 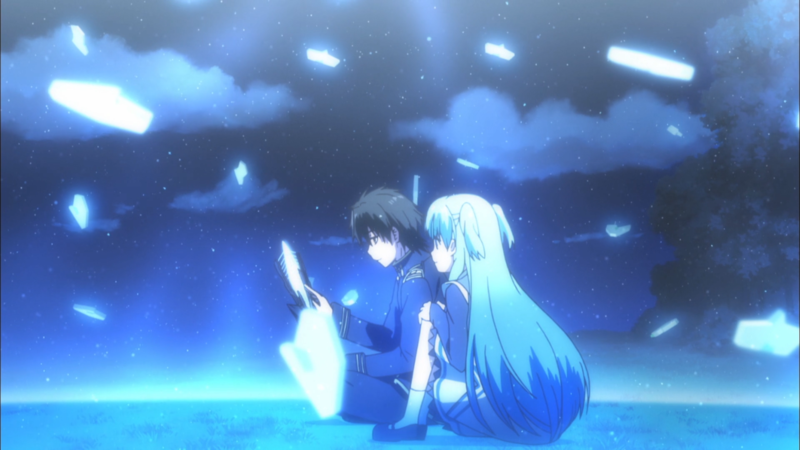 And, of course, the anime’s signature song “Scarborough Fair” – with its English lyrics, sweeping instrumentation, and bittersweet tone – may not be around as much as one would like, but, when it is, it captures the ear, ending up as the most memorable part of SukaSuka itself. After the OST, the opening track “DEAREST DROP” also does what it can to make a name for itself. The punchy guitar riff near the start kicks off the song in cool fashion, but the vocals and harmonizing do the most work in threading together this nice track. Some dynamism here and there, a fast-paced beat, and a distinct shaker going off in the background lend their aid as well, making the OP a catchy, fitting tune. If the OP somewhat represents the inevitability of death, then the ending track “From” represents that pursuit of happiness. Taking on a much livelier tone, the piano segments and acoustic guitar playing bring spirits from low to high over the course of the song. Once again, though, the vocals contribute the most as they hit those higher, powerful notes to give the music its emotion. The ED isn’t as interesting as the OP, and it isn’t exactly a playlist track, but it still has merits within the show. The creepy child messing with Chtholly’s head and the twinkling sound-effect when Willem tunes the carillons deserve a small shoutout alongside the OST, the OP, and the ED. All these elements together put SukaSuka’s music and sound in good graces (despite the voice acting not including anything of note). Having finished this twelve-episode series, I’m less entertained and more disappointed. The romance, one of its big selling points, felt more on sale than up as a priceless heirloom. I wanted to really like the relationship between Willem and Chtholly, but it never reached those love-filled heights to me. That’s mostly on Willem. He says as much, but he constantly either pushes Chtholly away or at least keeps her at arm’s length so as not to create any potential problems. I did like the romance nature of it all though. What with Chtholly blushing from the teasing by her friends or her jealousy of Nygglatho in general. I just didn’t see that all-important spark between the two to make what they had feel special and worth rooting for. Worse still, I didn’t care for almost any of the characters involved. I don’t hate them, but I can’t say that I will look back fondly on them as I continue watching more and more anime. Take Willem and Chtholly. Willem didn’t do anything too fun or too unique. And Chtholly was a kind girl, and I felt sorry for her that she could not beat back her destiny, but she got a bit annoying at times for how she handled some of her situations. Then there’s Ren who was cute and Ithea who was spunky, but they were always on the outskirts of most of the drama and the relationships until right at the very end of their presence in the show. Nygglatho’s attractiveness went wasted, and Grick’s coolness went underutilized. Even the fun kids of the warehouse, who had silly introductions and the occasional smiley aside, failed to leave an impression since they just weren’t around. I do appreciate the show for tackling some tough themes in its story, and I am glad that it managed to tell everything it wanted to in one season. Unfortunately, these details only help to keep me from writing this one off completely. Shuumatsu Nani Shitemasu ka? Isogashii desu ka? Sukutte Moratte Ii desu ka? has its heart in the right place but without the necessary structure to make its message heard. Strong themes for its story are muddied by weak narrative choices. The artistry and the characters pass but miss out on finer execution. And the music is a positive, but it can’t take care of all of the show’s uninteresting elements. Indeed, this project needed a bit more work to uplift it to the pinnacle. Tags: Review : Shuumatsu Nani Shitemasu ka? Isogashii desu ka? Sukutte Moratte Ii desu ka? 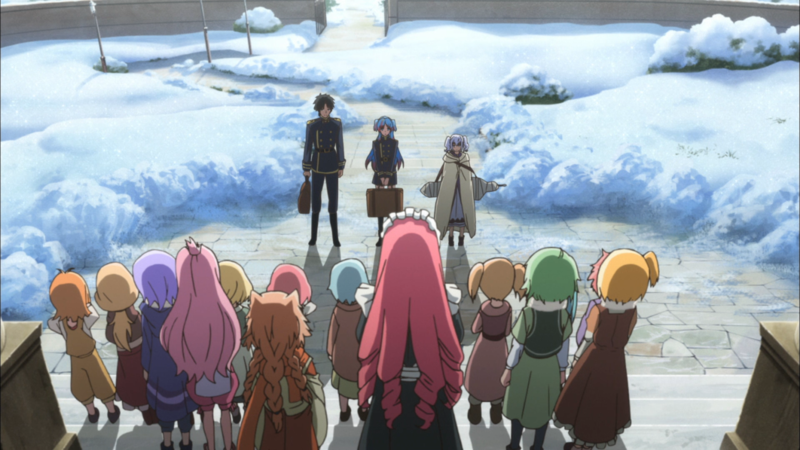 : Spring 2017 : SukaSuka : The Chuuni Corner : WorldEnd: What do you do at the end of the world? Are you busy? Will you save us?